Magician, writer, historian and actor: Ricky Jay, lately gone and much missed, once wrote a book titled Cards as Weapons. The book was as good as its word. Jay was famous for, amongst other things, being able to throw playing cards with such force and accuracy that they could pierce the pachydermous hide of "her majesty the watermelon". I have seen the book but never read it. It is a glossy paperback affair that goes, as many Jay books go, for silly money on Amazon. The reason I mention it is because cards are weapons. They can be weapons. Lots of things can be weapons. 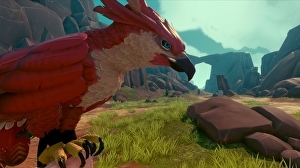 In Falcon Age, which I have been playing this week, your pet falcon is a weapon. Weapon is probably not quite the right word, and pet is very definitely the wrong word, because in this lovingly imagined culture, by far the best element of this wonderful game, falcons are revered. They are not pets, and they are not quite tools. They are equals. It is a privilege, you come to feel, to have one to hand. This fundamental respect for the bird, this desire to do right by it despite the fact you can unlock a doodad that allows it to juggle, stops your falcon from ever becoming a mere weapon, or worse, a button press with a cooldown. Falcon Age is a compact open-world affair in which you stick it to awful robotic colonialist/industrialists one act of sabotage and rebellion at a time. You head out with a neat whip-baton thing in one hand and your bird on your other, and you send the bird to attack things, collect things, yank things about and hold them up while you give them a shoeing.